After numerous meetings and specific soil testing for texture, chemistry and biology in the fall of 2008, the team decided to work on the two northernmost parks so we could compare the results and develop a program that the conservancy would eventually take over and manage in-house. Step by Step to a Greener Greenway. 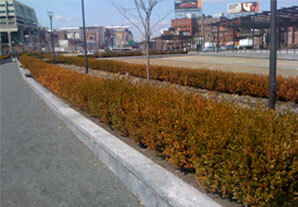 April of 2009: The Boxwoods lining the lawn space were yellow. We dug down and discovered the plants had minimal rooting mass. Our immediate goal was to turn these plants into more vibrant looking hedgerows. We created a compost tea high in protozoa to increase the nutrient cycling and also included microbe foods to aid in mycorrhizal development and organic fertilizers. 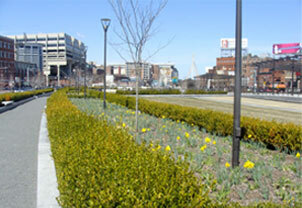 Result: As spring temperatures increased, plants became green once again as a result of our efforts.